Some cats like to chew on thin plastic cords and oxygen tank tubing. This is dangerous and causes permanent damage to the hose, preventing the oxygen from being delivered to you through the tube. Cats chew items like tubing due to boredom, stress, curiosity or during their teething period as kittens, according to Vetinfo. Provide suitable and safe alternatives for your cat to chew on, while deterring the cat from chewing on your valuable medical equipment so the two of you can live in peace. Spray a taste-deterrent spray on the entire length of the oxygen hose. Cats do not like the bitter, unpleasant taste of these sprays. Introduce the scent of the spray to your cat by spraying it on a tissue and putting it into the cat's mouth. The cat will spit it out and associate the smell with the unpleasant taste, avoiding the oxygen hose, recommends the American Society for the Prevention of Cruelty to Animals. Wrap the oxygen tubing in an electrical cord protector designed to prevent pets from biting through the cords. These protectors prevent the cat from chewing through the tubing and come scented with citrus or other scents unpleasant to cats. Wrap the tubing in aluminum foil or double-sided tape. 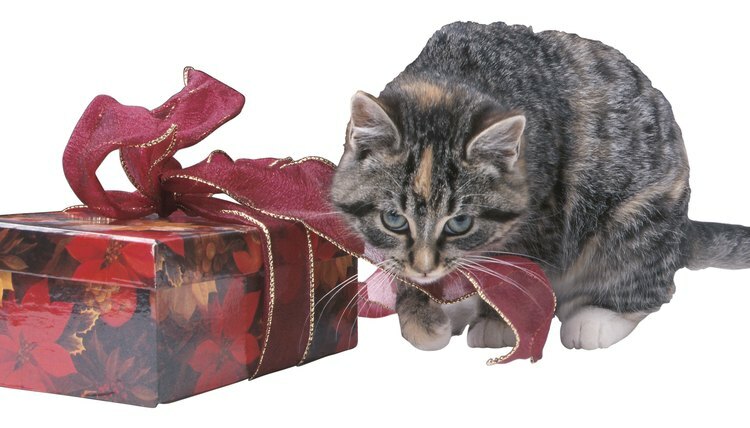 Cats do not like the texture of foil or sticky tape, and will not chew on it, discouraging the behavior. Fill an empty soda can with nails or pennies. When the cat tries to chew on the oxygen hose, immediately shake the soda can to scare the cat. Do this each time the cat starts to chew, so that the cat associates the loud sound with the chewing to discourage this behavior. Give your cat some dog chew toys made of plastic for it to chew on. Spread fish oil over the surface of the toy to make it desirable for your cat, according to the Cornell University College of Veterinary Medicine. Feed your cat dry kibble to satisfy its need to chew. Give it crunchy cat treats as well, especially when it ignores the oxygen tubing. Prevent boredom by playing with your cat for 10 minutes at a time during the day. Use an interactive toy such as a laser pointer or a cat toy on a string. Never punish your cat for chewing on the tubing; instead, distract it with a loud sound. If your cat continually chews on the hose when unsupervised, such as when you are asleep, confine the cat to another room during this time until you can supervise it in your presence.